This is for the chocoholics among chocoholics! Rich, creamy and indulgent. 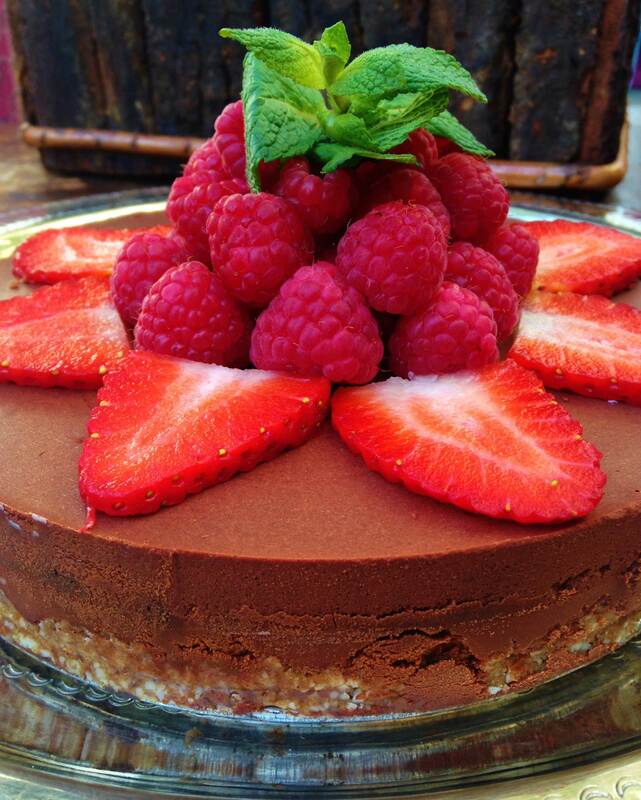 An intensely chocolaty velvety filling over a crunchy raw almond and date base and topped with juicy raspberries. 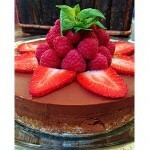 This is the perfect decadent dessert and is totally refined sugar free, grain free, wheat free, gluten free and vegan. Perfect for dinner parties or a scrumptious treat. Start by greasing a cake tin with coconut oil. You also need to cut a circle of grease proof paper to put at the bottom of the tin as the base is quite sticky and hard to get off even when greased. Add the ingredients for the base to the food processor and blend for about a minute until a sticky mixture forms. Spoon the mixture on top of the grease proof paper and using your hands press it down into the bottom of the tin. Then place it in the fridge to cool whilst you make the filling. Add the raw cacao to the melted coconut oil and whisk until combined. Then add the maple syrup and lastly the coconut milk whisking continuously as the mixture thickens and becomes a divine glossy texture. 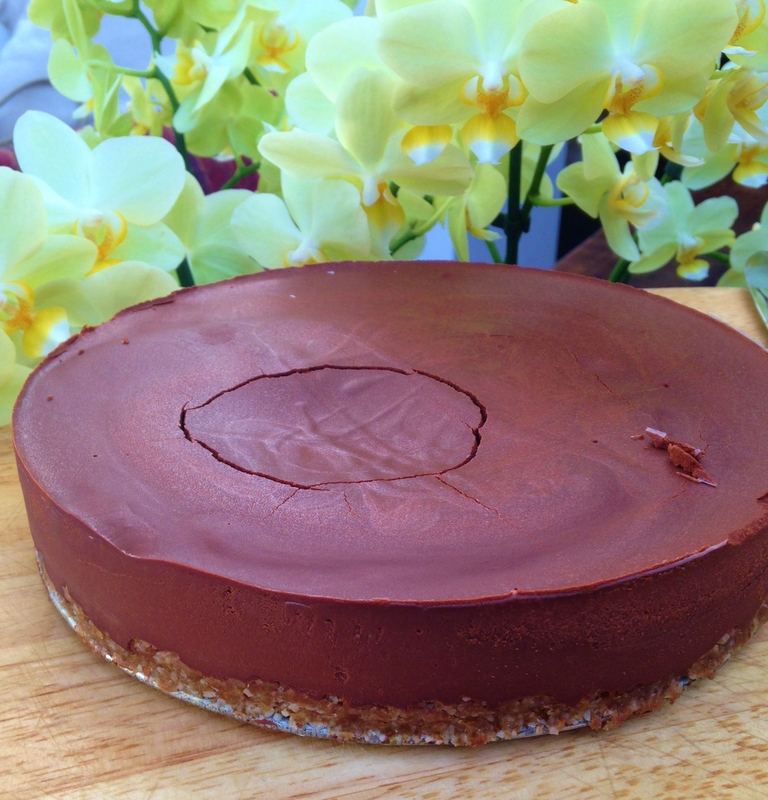 Pour the chocolaty filling on top of the base and put back in the fridge for 2-4 hours to allow the cheesecake to set. 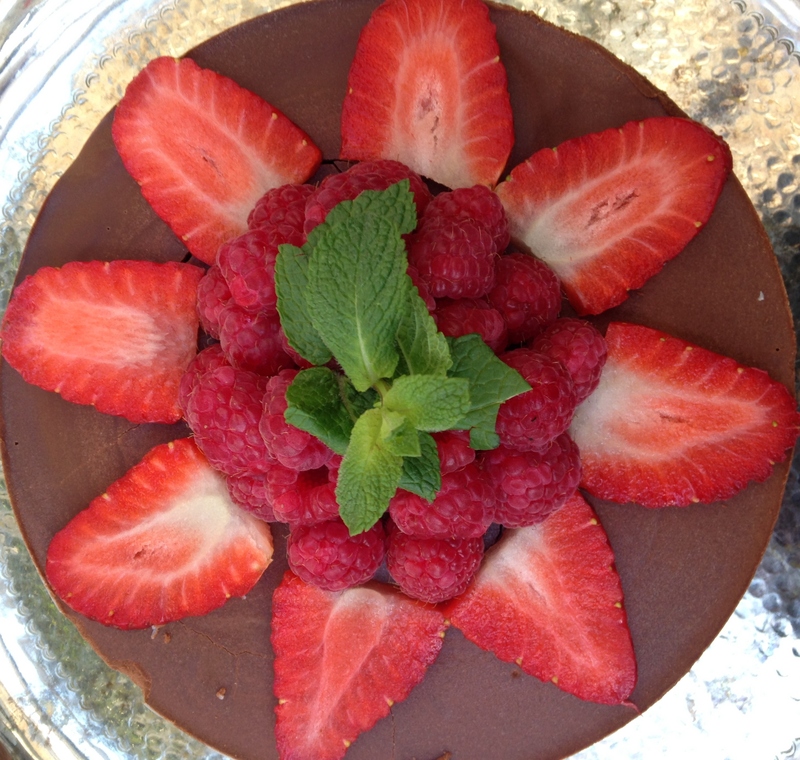 Once it’s hardened remove from the tin and sprinkle with juicy raspberries, sliced strawberries and fresh mint. This needs to be removed from the fridge 1 hour before serving or its too solid.